Home > What is a Surety Bond? What happens if a bond agreement is violated? At what rate can I get bonded? 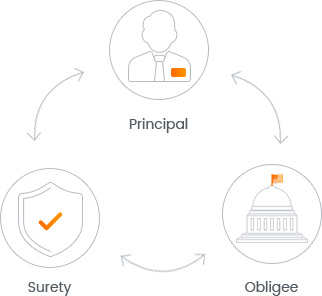 The purpose of surety bonds is to guarantee that the principal will comply with the obligations and responsibilities specified in the bond agreement. Unlike insurance, which protects the one who obtains it, surety bonds are for the benefit of the party requesting the bond (the obligee). If, for whatever reason, a principal fails to meet their obligations and violates the bond agreement a claim can be filed against the bond by the obligee to request compensation. The surety may then step in, take charge and compensate the obligee for their losses. Ultimately, though, it is the bond principal who is liable for the cost of a claim against their bond. In this way, regardless of the type of surety bond, surety bonds work like a line of credit extended to the principal by the surety bond company. In case of a legitimate claim, the principal has to repay the surety for the financial support it offers to resolve the claim. If the principal does not violate their surety bond agreement then they only need to pay the cost of getting bonded which typically is a small percentage of the total amount of the bond. The guarantee extended by surety bonds depends on the type of business you have, and why your business is required to have a bond. The vast majority of bonds fall into the commercial bonds category, which is also known as ‘license and permit surety bonds’. These bonds are usually required for auto dealers, freight brokers, collection agencies, mortgage brokers and telemarketers, to name a few. They are used to guarantee that the individuals or businesses abide by the rules and regulations of their business license. In fact, they are usually a prerequisite for obtaining the business license in the first place. In the case of a claim on a commercial bond, the surety’s coverage is related to mitigating harms that concern violations of the business license, such as fraud, misrepresentation, dishonesty and others. These bonds guarantee that motor vehicle dealers will operate in compliance with state regulations for their dealer license. They provide protection for the state and an auto dealer’s customers. Transportation brokers need to obtain a $75,000 freight broker bond as part of the licensing process of their business. Freight broker bonds guarantee payment to motor carriers and shippers who do business with a broker. Mortgage brokers need to get bonded as a requirement for obtaining a business license. The bonds protect customers who work with brokers to obtain a mortgage. Contract bonds guarantee that a construction project will be completed by a contractor in accordance with federal and state regulations as well as the terms laid out in a construction contract. Bid, performance, payment and supply bonds all fall under the category of contract bonds. The various contract bonds serve to protect the government (whenever it is awarding a contract) as well as parties who work with contractors, such as suppliers, laborers and subcontractors. These bonds function as security for bids submitted by contractors on a project. They guarantee that the bidder will execute the contract at the bid price if they are awarded the contract. Performance bonds guarantee the proper execution of all terms and conditions of an awarded construction contract. A payment bond serves as a guarantee that a contractor will pay their subcontractors, laborers and suppliers for work and materials. Supply bonds guarantee that a material supplier will furnish supplies to a project owner as contracted. Most commonly, court bonds deal with an estate or guardianship situation. These bonds typically guarantee to the court that any assets or estate will be handled responsibly. In certain cases, a court bond may also be required of individuals seeking to appeal a court ruling. To get bonded, a business needs to pay a fraction of the total bond amount which is called a bond premium. Depending on how high your credit score is, commercial bond premium rates fall into two categories. Applicants with a credit score around or above 700 FICO are typically offered so-called standard market rates that range between 1%-4% of the total bond amount. Applicants with significantly lower credit scores are offered bonds at bad credit rates, ranging between 5%-15% of the total bond amount. Learn more about getting bonded with a low credit score through our bad credit surety bond program page. To get an estimate of the cost of your bond, try our bond calculator below! It is best to avoid claims on surety bonds and typically this is the case. Occasionally it happens that a dispute cannot get resolved and obligees file a claim against a principal’s surety bond. When that happens, the surety bond company underwriting the bond has to respond by launching a claims investigation. During the investigation, the surety reviews the situation and each side’s actions up to that point. If it is established that the claim is legitimate, the surety will usually engage and compensate claimants if they have suffered financial harms due to the principal’s actions. In the case of a contract bond claim, the surety may take over the project from the principal and complete it. In either case, the bond principal is liable for any claim that arises against their bond and must reimburse the surety in full if it covers a claim. To get a free quote for your surety bond, you can complete our online bond application form. We will then provide you with a quote, along with additional details on continuing the bonding process. If you have any further questions, you can also call us at (866)-450-3412 to speak to one of our surety bond experts. For more information on the bonding process, and surety bond requirements, see our how to get bonded page.